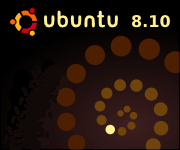 The new Ubuntu 8.10 is going to be released in a few days. The brave souls can download the release candidate and play around with all the new features. From my experience the Ubuntu release candidates are quite stable and you can drop the old repositories for the new ones to get all the update after the official release. So if anyone is in a hurry he/she just might as well install it on his/her machine. I would not recommend it on production machines though because you never know when the nasty bug will hit you. There are numerous upgrades on this release. We have the usual suspects of new versions for gnome and kernel but more “exotic ones” as well such as the encrypted directories and the long awaited improved connection manager that allows the road warriors to manage their 3G connections of their laptops. Along with Ubuntu, the Xubuntu and Kubuntu distros will be released for the fans of Xfce and KDE desktop environments. The new releases will not be LTS, even though this will not be an issue if you are not planning to use it on a production server. I was not very happy with the previous release and had problems with it. Lets see if all the issues were resolved in 8.10.